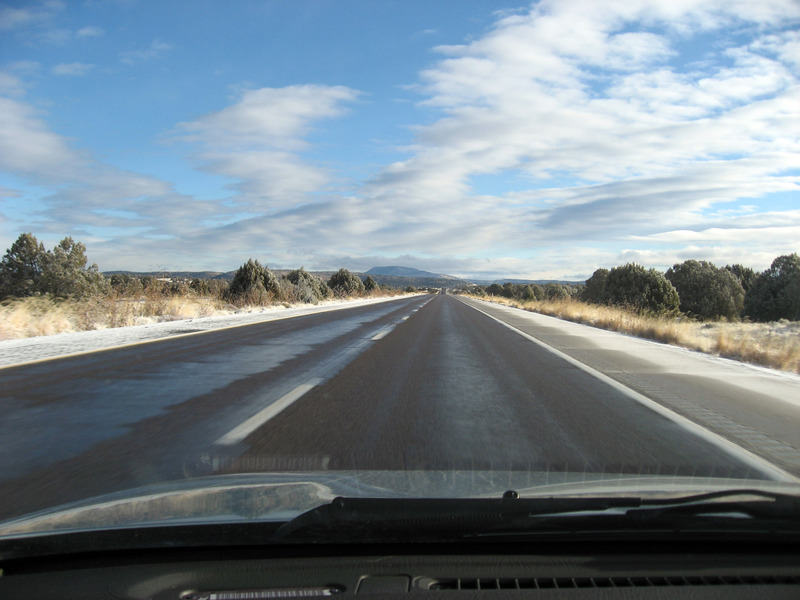 The snow in California wasn't so good, so on Thursday, 1/4/07 I left to drive out to Arizona, New Mexico, Colorado, and Utah to find some better skiing. Some pictures are found below. I spent the night in Kinston, Arizona, and got up and started toward the "WorldMark" (timeshare) in Overgaard, Arizona to meet up with my brother and family and my parents. 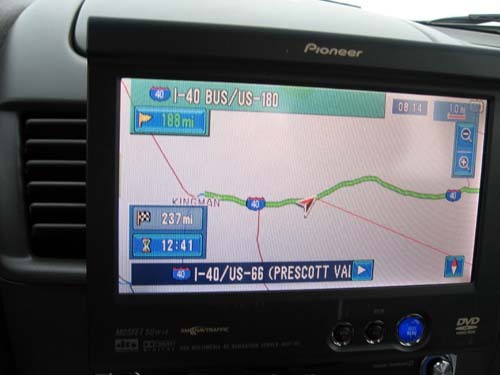 Below is a picture of my car's GPS as I head out for the day. Below is a picture of rush hour on highway 40 in Arizona. 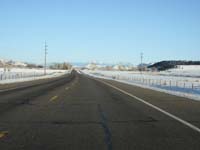 Notice the snow along the sides of the road. 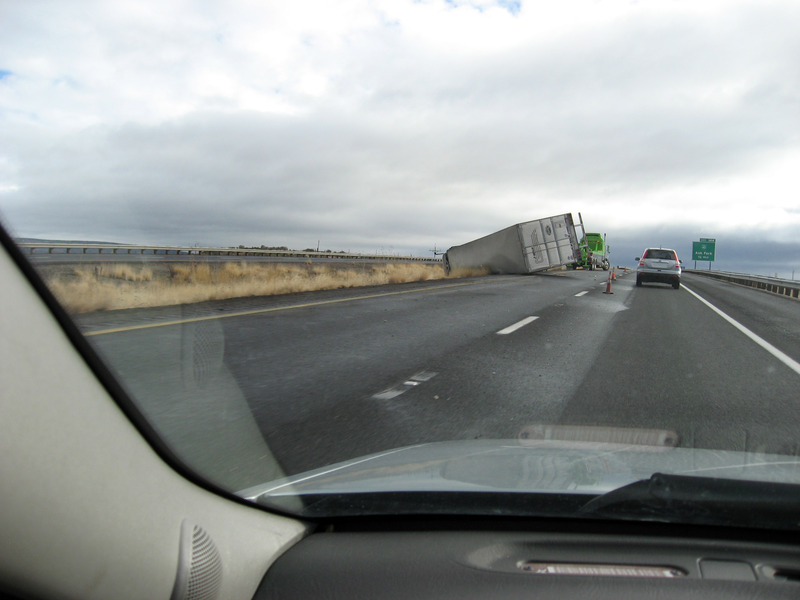 The only interesting thing that happened this day was I passed this overturned 18 wheeler big rig in a ditch. Eli (my nephew), and Randy (my brother) facing away. Eli with eyes half shut, Ari (my niece) perking up for the camera. 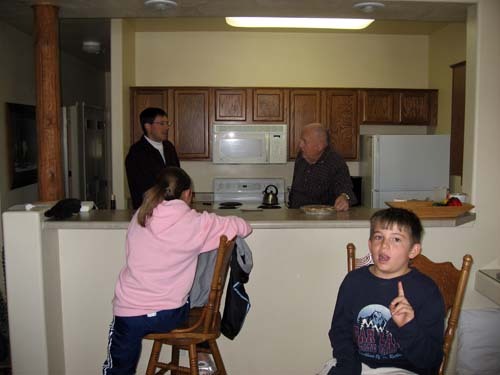 Randy in back with Howard (my dad), Ari and Eli in front. 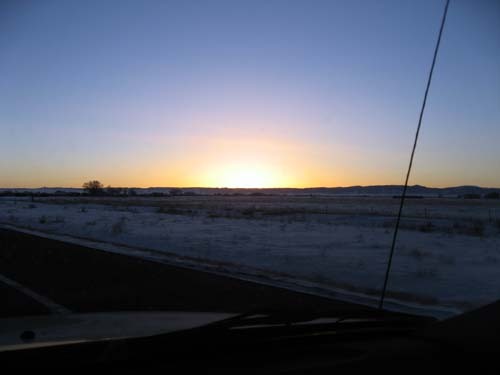 A picture through my Sentra's side window as the sun goes down. On 1/8/07, I got up from the Super 8 in downtown Pagosa Springs, Colorado, and drove 30 miles to ski in Wolf Creek, Colorado. 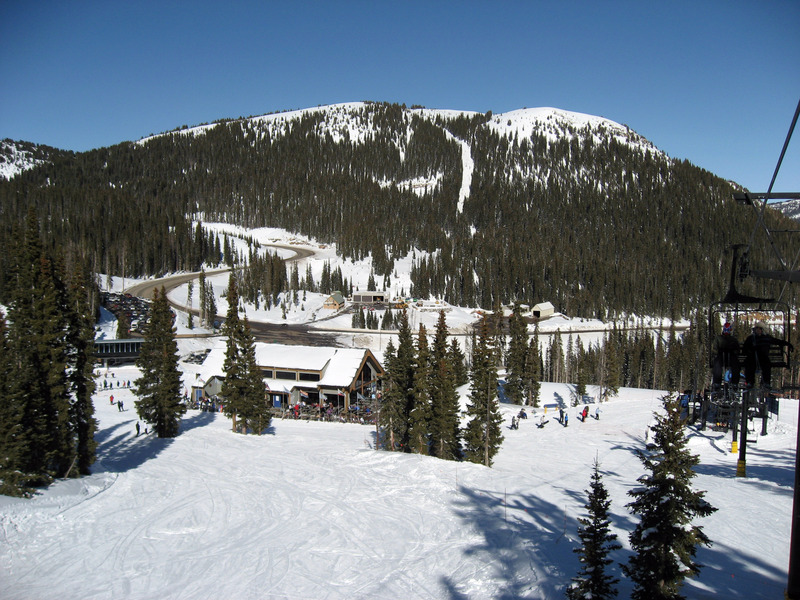 Wolf Creek is famous for getting more snow than any other Colorado ski resort. 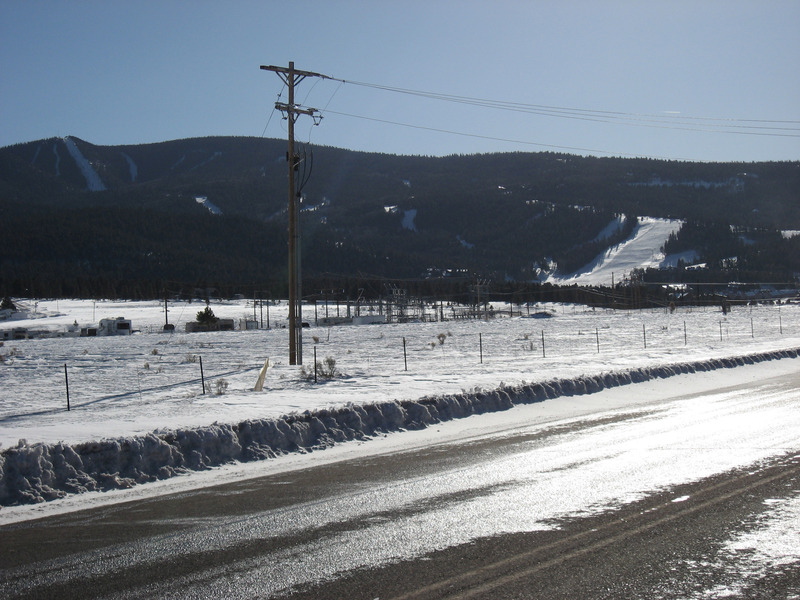 It isn't a huge ski resort, but a little bigger than your average 2 lift family ski area. Overall I liked it, good snow, pretty good varied terrain, a LOT of tree skiing if you want it. The only real downside of this ski area is they don't have anything super challenging (nothing you would call a double-black at Telluride or Vail). Below is a picture as I drive out of Pagosa Springs, Colorado towards Wolf Creek. This is a picture over my shoulder looking DOWN the hill from the lift as I ride up the first lift of the day. Notice all the tree skiing available. Here is a lift map of the Wolf Creek Area (click on the map to get a much larger version you can read all the lift names on). 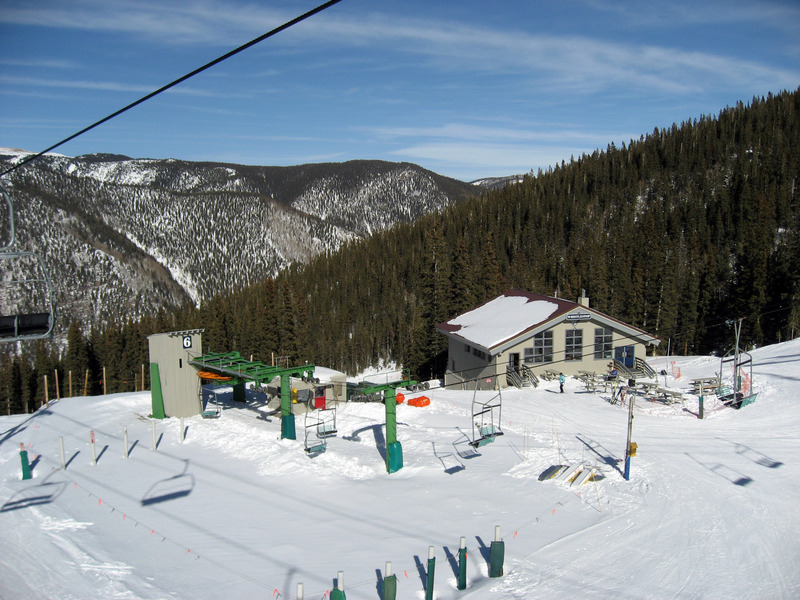 This panorama is from the top of "Raven" chair, far skiers left. 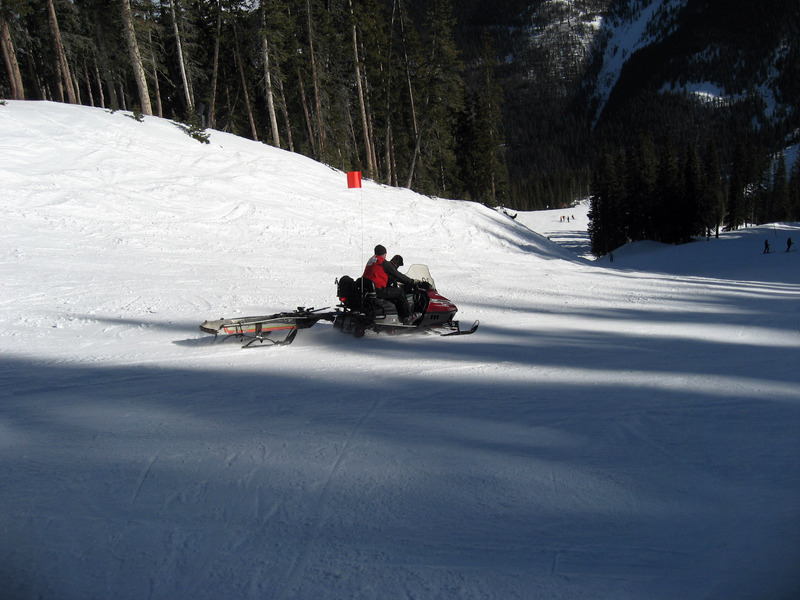 Here I am riding up "Bonanza" chair. 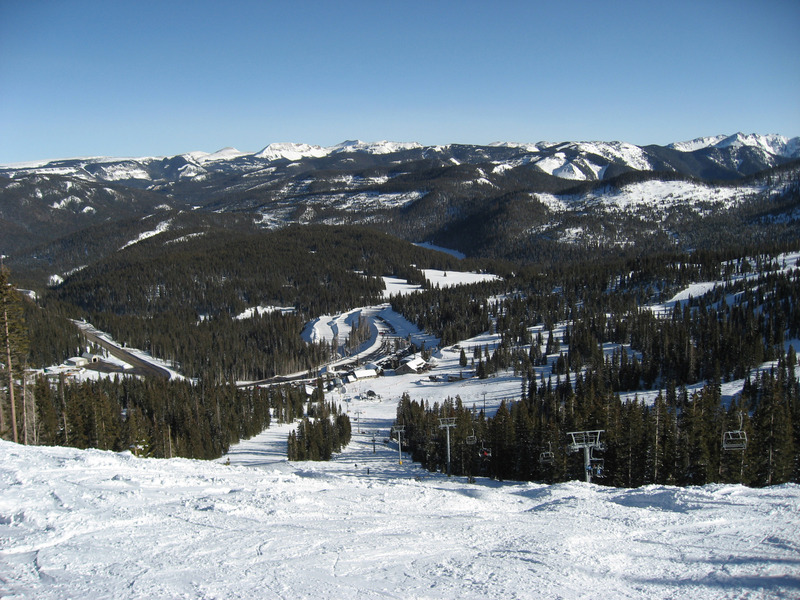 The following panorama is from the top of "Treasure Chair", from 11,775 feet at the very top of Wolf Creek. 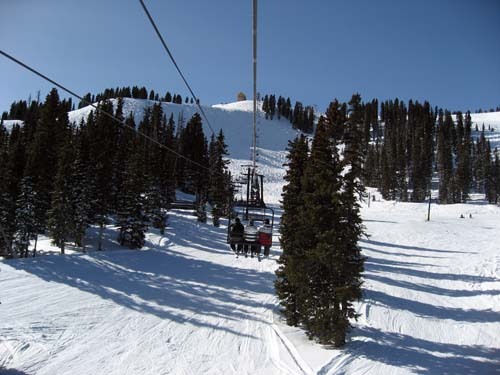 This picture was taken from the chair lift, and shows how much tree skiing is available at Wolf Creek. 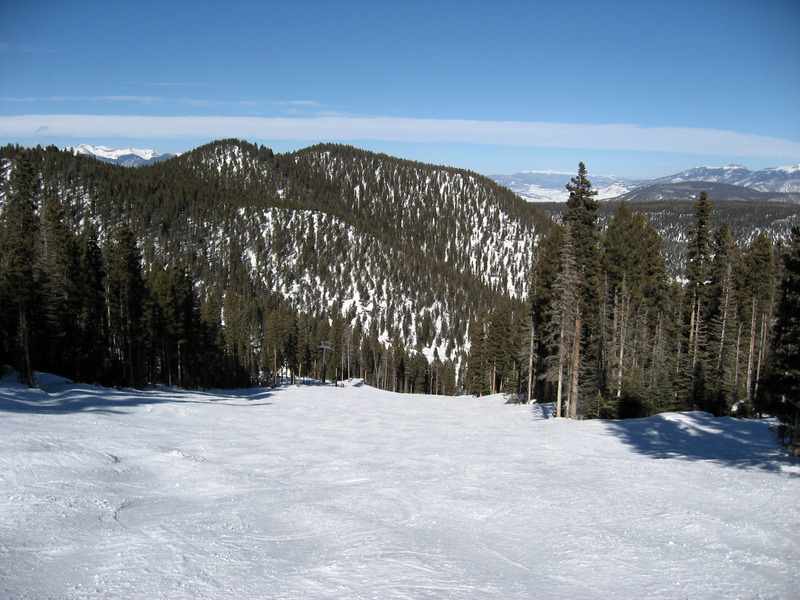 It's really, really great tree skiing terrain for upper intermediate level skiers or lower advanced level. 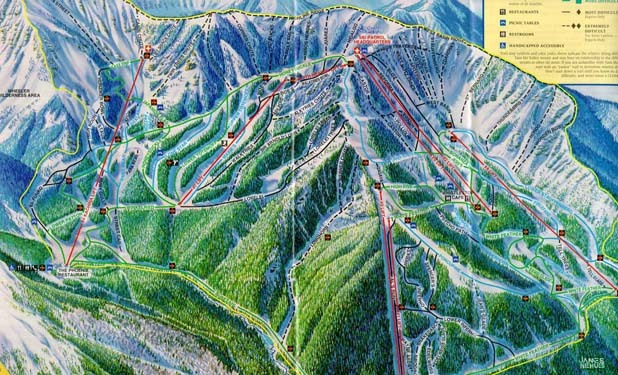 If you look in the picture below, you will see how Wolf Creek does their large trail maps. They staple one of their folding lift maps to a piece of cardboard and stick it in the snow!! **THIS** shows they aren't a world class resort like Vail or Telluride, who wouldn't be caught dead with such as jenky system. At lunch in Wolf Creek out on the deck. Reasonable lunch facilities for a small area, nothing huge, and no mid-mountain lodges at all (this is at the base next to the parking lot). A picture of the base facilities from the ride up the lift after lunch. This is a picture from under the "Alberta" lift on far skiers right on the mountain. 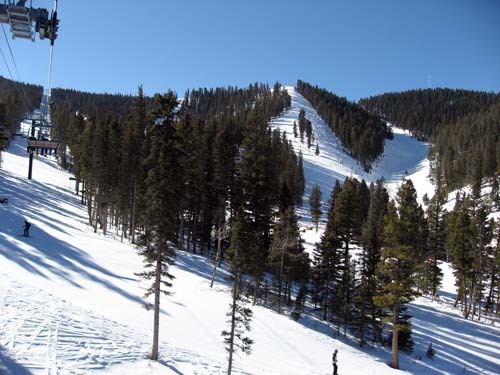 It has the most black diamond terrain found at Wolf Creek, and has a lot of nice tree skiing. 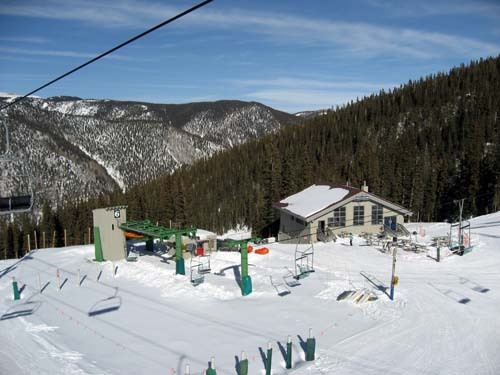 Click HERE to see a Wolf Creek Lift Map. "Alberta Lift" is also the longest lift at Wolf Creek. 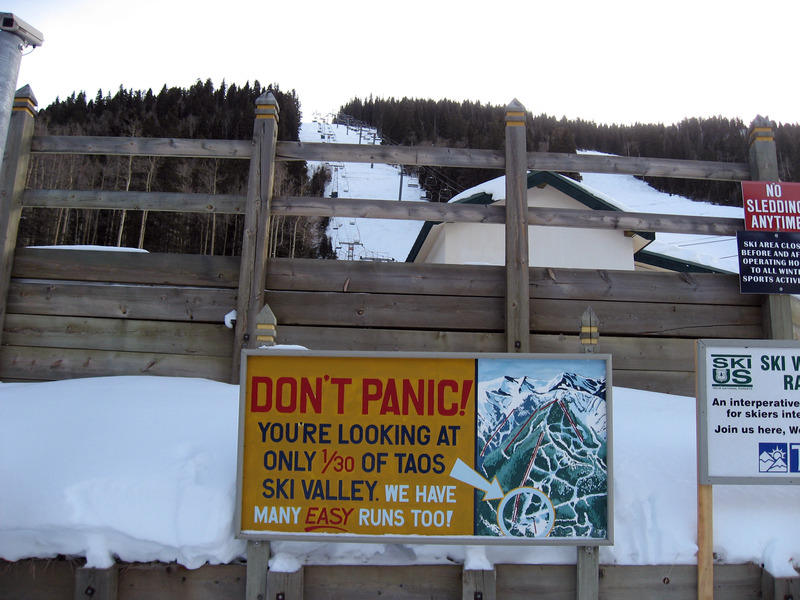 On 1/10/07 I skied at Taos, New Mexico. 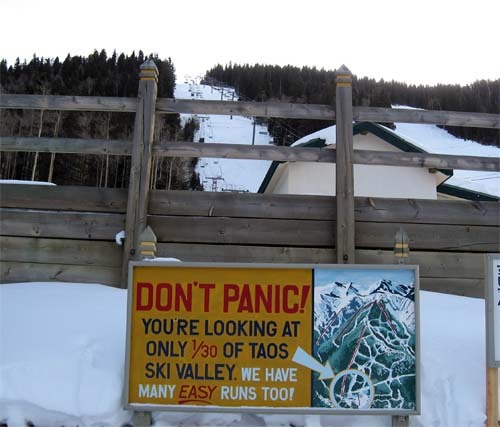 Taos is famous for being a very advanced, challenging mountain, and I love this sign (pictured below) that is right as you get on the first lift. 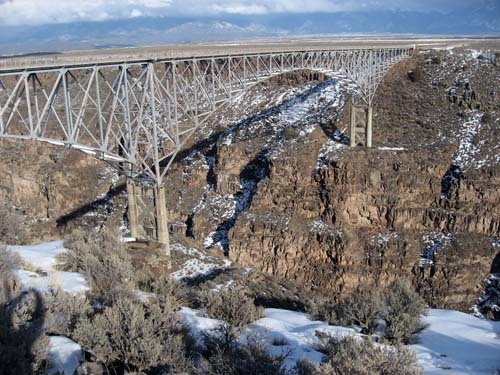 This is a picture of the "base area" from just above it. Here at the very top of the lifts. You can hike from this point higher up the mountain. 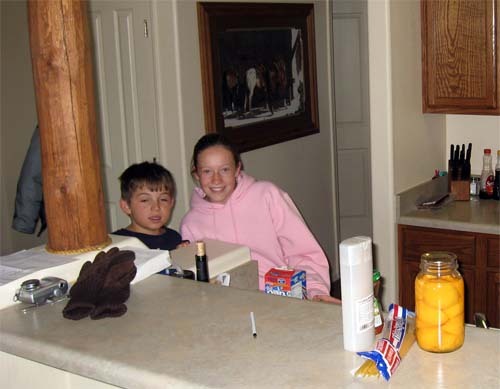 Look closely at the picture below. 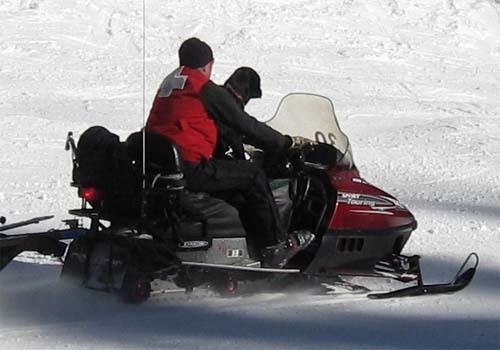 That's a black dog riding shotgun with this ski patrol man on his snow mobile. I had to chase him on skis to get this picture. Picture from the top of chair #4 (Kachina Lift). Picture at the bottom of chair #4 (Kachina Lift) where I ate lunch at the Phoenix Grill in Taos. 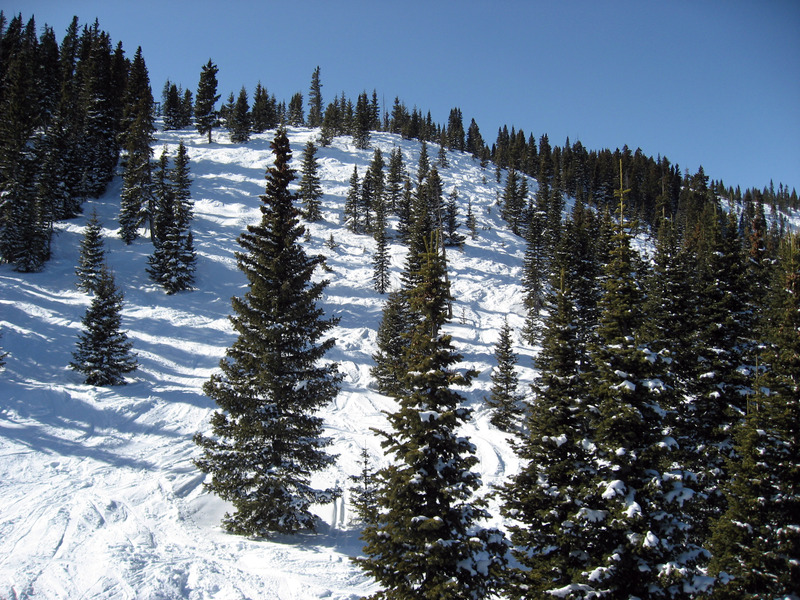 This picture was taken in Lorelei Trees in Taos Ski Area, New Mexico. Now THAT'S tree skiing baby! 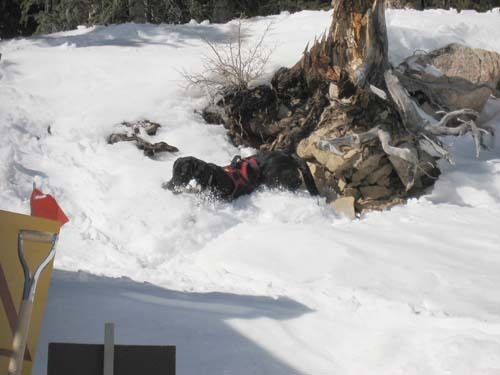 That is a search and rescue dog (the dog is black, facing left) playing in the snow. Very cute. Random picture taken from the lift looking up the hill. I don't know why I find this photo so compelling. 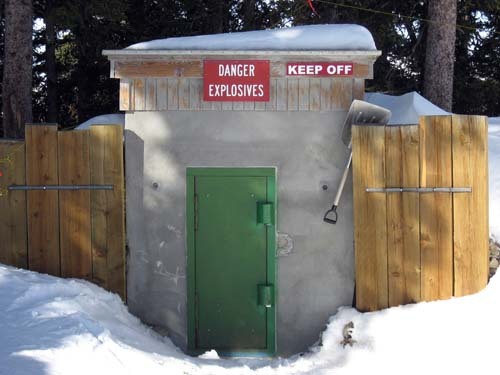 I guess they store their dynamite in this shed randomly out on the ski area. 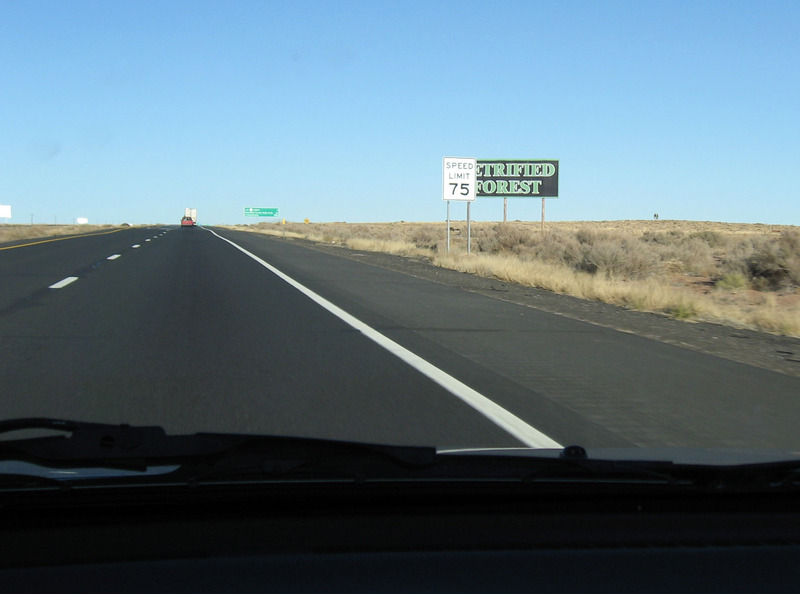 "Keep Off" is hilarious, like you would climb on random sheds you find? 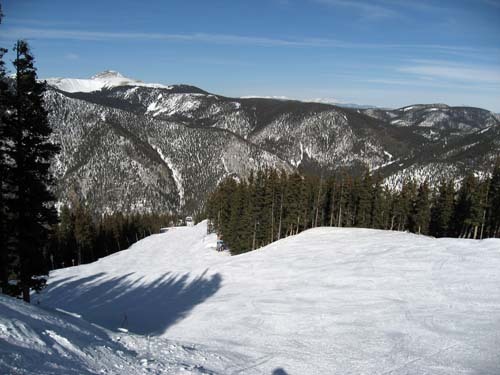 Nice picture looking down the ski slope at Taos, NM. 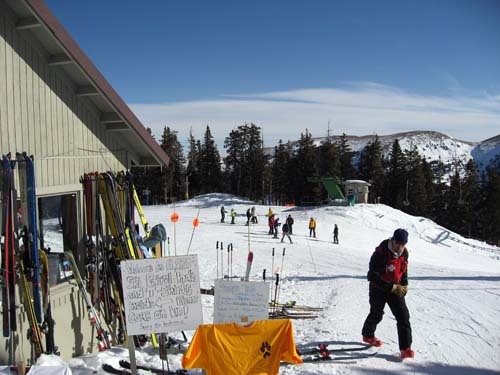 The building pictured below is the "Whistle Stop Cafe", a mid-mountain lunch spot in Taos Ski Area, NM. The "ridge" pictured below is the most famous Taos Ski Area ridge, featuring runs like "Juarez". It was closed this day, as were a lot of the double-black runs. I have to put in a plug for the cheap hotel I found. For $49/night, this is the cleanest, nicest hotel room I've seen in YEARS. It looks like they finished building it just recently, and even includes a (kinda small) gas fireplace you can see by the door. The hotel is "Indian Hills Hotel" in Taos, New Mexico, and the location is great (a 2.5 block, 5 minute walk to the cool restaurants and bars in Taos in "the plaza"). That's my laptop in the picture below. The reviews on the web alternated between "horrible unclean dive" and "awesome", and there seem to be two different wings. Ask for the newer wing. :-) I was in room 227 (pictured below). 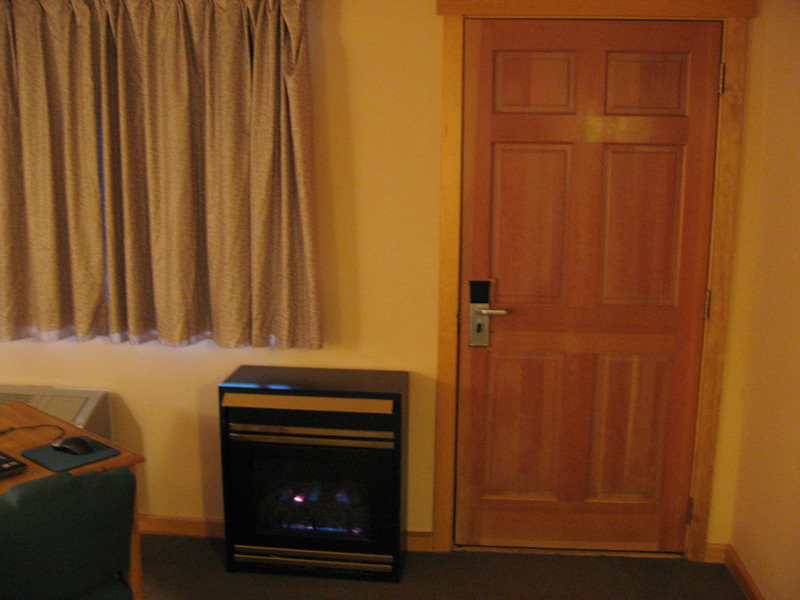 A close up of the gas fireplace next to the hotel room door. Again, this is a bargain basement cheap hotel, they didn't even mention the gas fireplace. 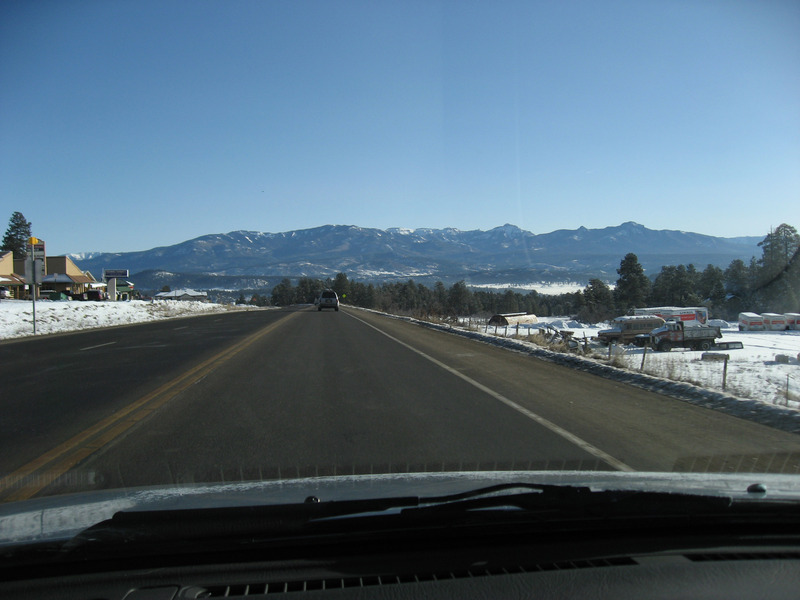 On 1/11/07 I skied AngelFire ski area, in New Mexico. 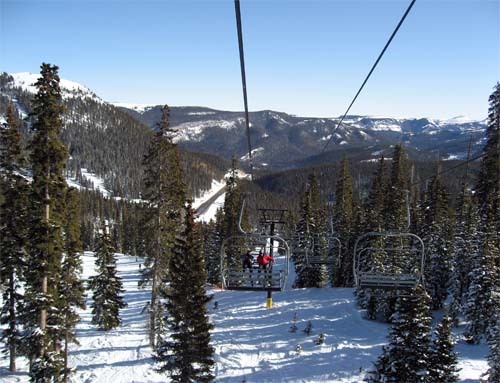 It is a mid-size ski area, only two real lifts but both of the lifts are quite long and service a good size amount of intermediate terrain and a couple short black diamond runs. Unfortunately, the day I was there I paid a full $52 lift ticket and the front lift was closed all day due to wind, and then the BACK lift (the only other lift) closed at 1:30pm due to wind, so the ski area was ENTIRELY shut down. Since they were saving money in not running any lifts, I felt it would have been appropriate for the ski area to offer us full-fare-paying-skiers something to make a gesture, like maybe a free half-day ticket, but AngelFire just isn't that interested in any good will. I won't ever be going back. 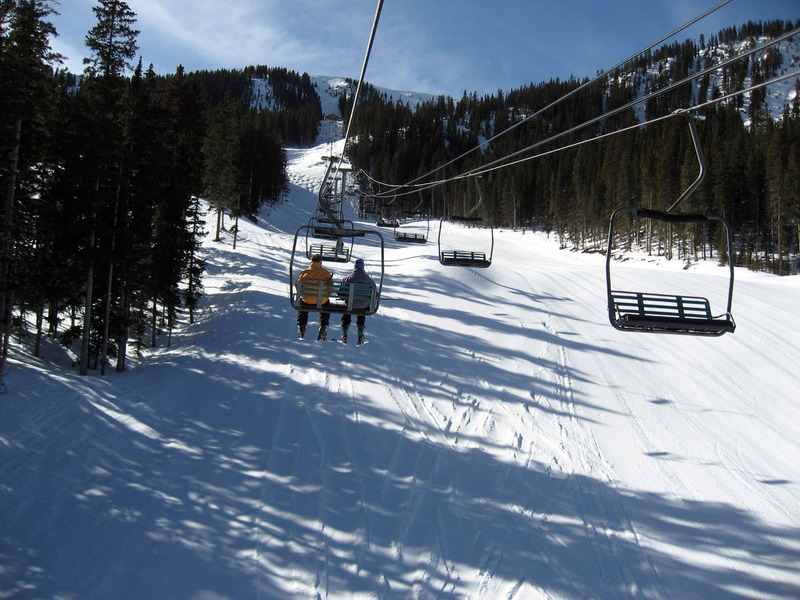 (Some locals said AngelFire has shut down lifts due to wind about once per week, so AngelFire really screws many people out of their full fare lift tickets, not supplying the service we paid TOP dollar for.) 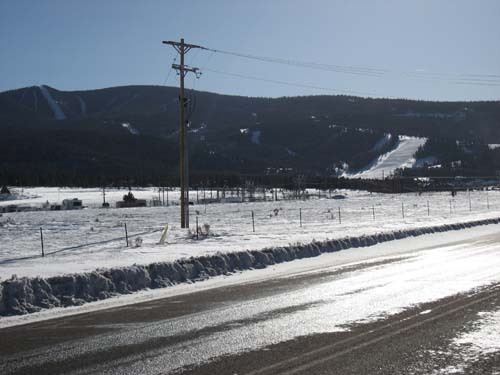 Below is a picture from the road up at the ski area. 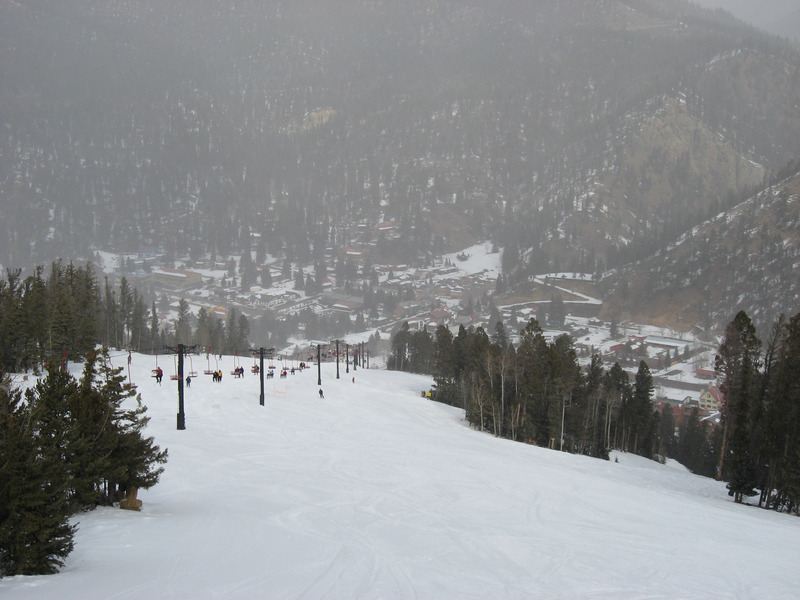 After getting shuttled around to the back side of the mountain (since the only lift servicing the front of the mountain was shut down), here is a picture taken from AngelFire's slopes. 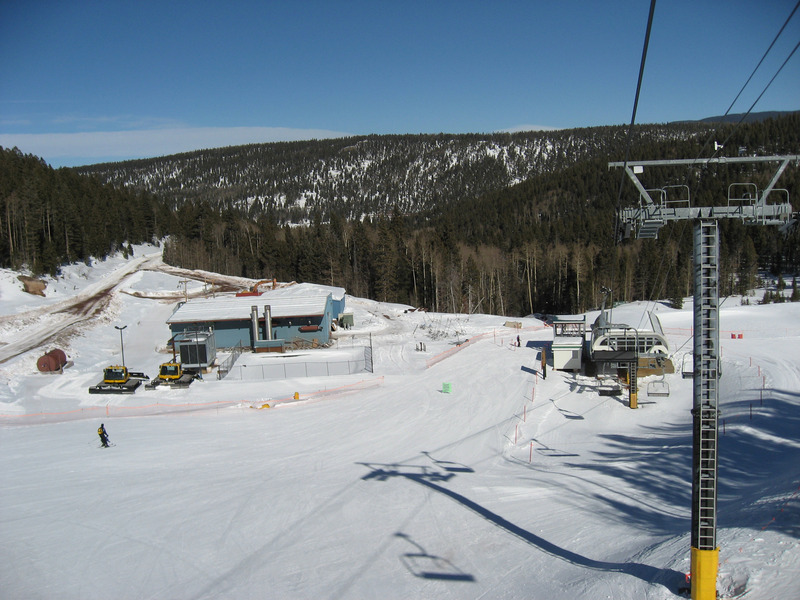 A picture of the back lift in AngelFire, the only one open this day, and then only open for a couple hours. AngelFire did NOT refund any of the ticket price, even though they could not produce a single working lift after 1:30pm. 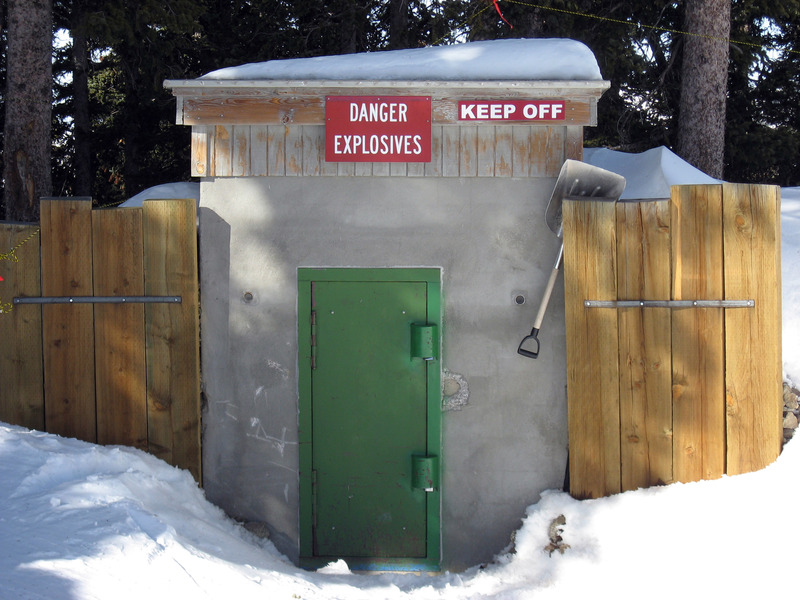 The locals say this happens once per week, so I'm going to avoid this ski area in the future. A picture of the slopes of AngelFire ski area, New Mexico. 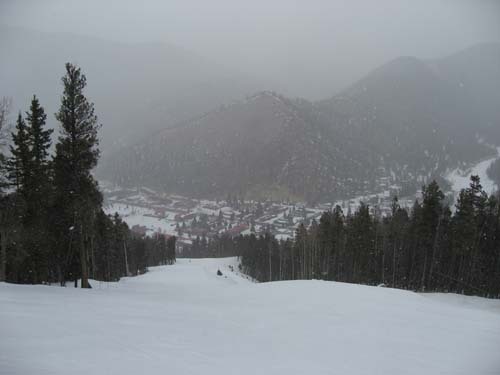 Picture looking down one of the longest runs at AngelFire, New Mexico. I think this run is named "Bodacious". The main base area of AngelFire ski area, New Mexico. Here is the base of "Red Chair", Red River, New Mexico. 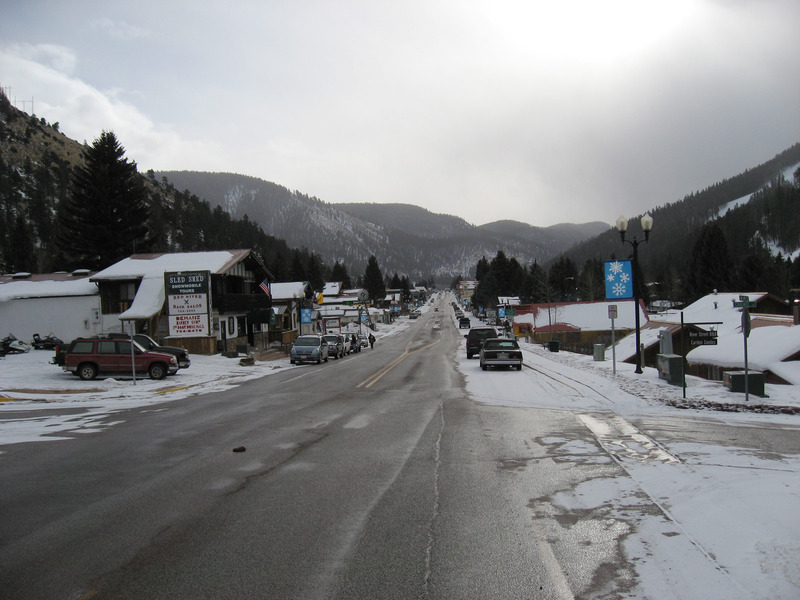 A picture of the town of Red River, New Mexico from the slopes of the ski area. This is a picture of the "Rio Grande Gorge Bridge", found near Taos, New Mexico. Second highest ? span bridge in the United States. 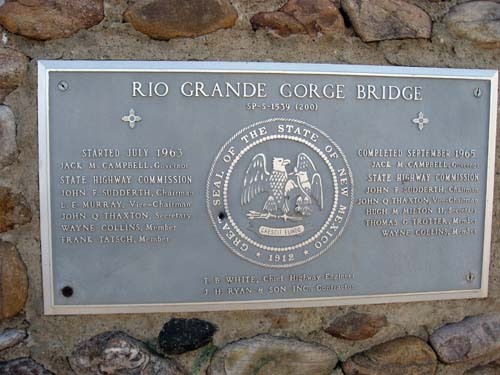 Here is the plaque for a little more info and reference. 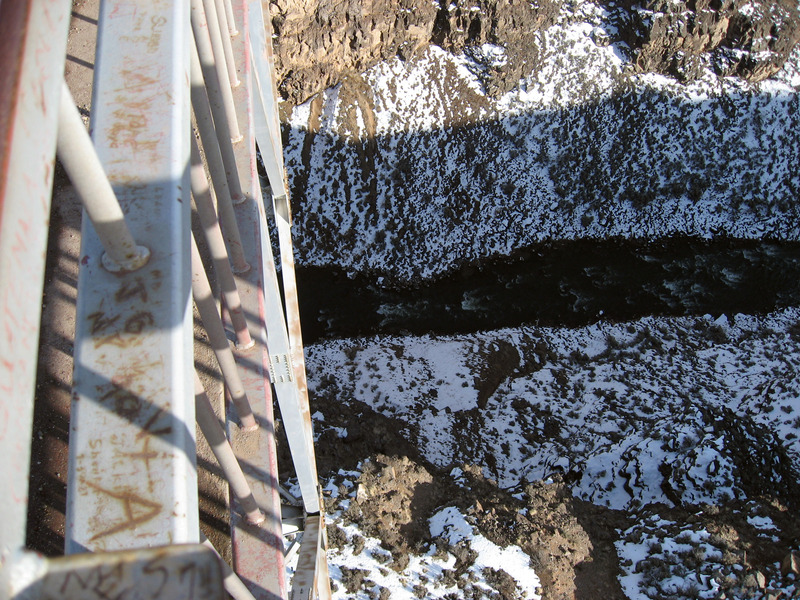 A picture straight down from the middle of the bridge. On 1/13/07 (Saturday), I was staying the weekend at my brother's (Randy's) house in Albuquerque, New Mexico. 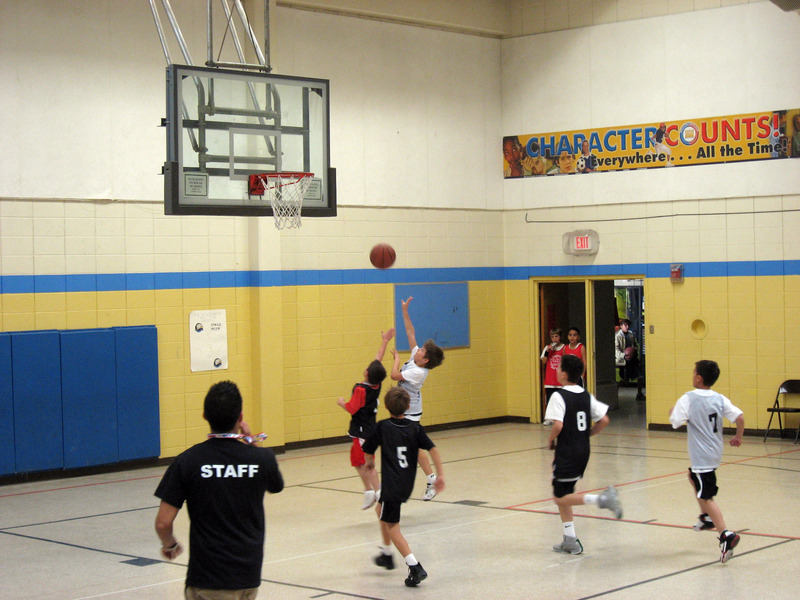 On this Saturday we went and watched Eli (my nephew) play basketball. Eli is 10 years old. Below Eli is shooting a basket, he is number 6 in white. 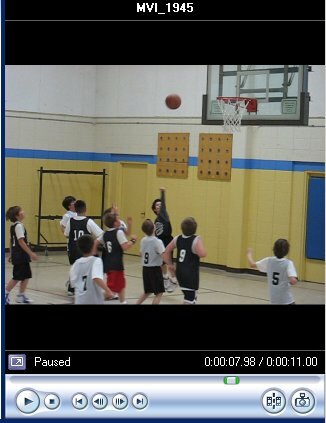 Click on the movie below to play an "mp4" (MPEG-4) movie of Eli scoring a different basket. Eli is the #6 in white. If you have trouble playing the above movie, try downloading this ZIP file containing a Windows WMV file (it will take a very long time), then playing the movie inside the zip file. On 1/13/07 at night I was helping Ari (my 12 year old niece) with some math homework. You can see Ari working below. The glass of red wine on the table is mine, not Ari's. 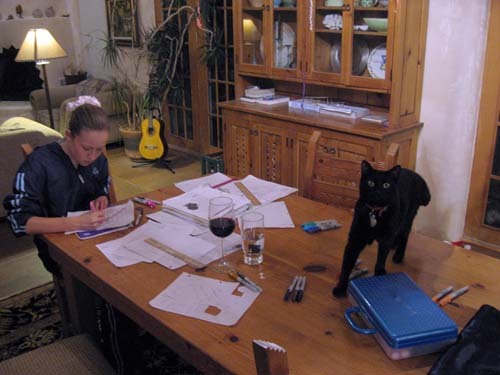 :-) The black cat's name is Angie, she wasn't really helping, more like getting in the way. 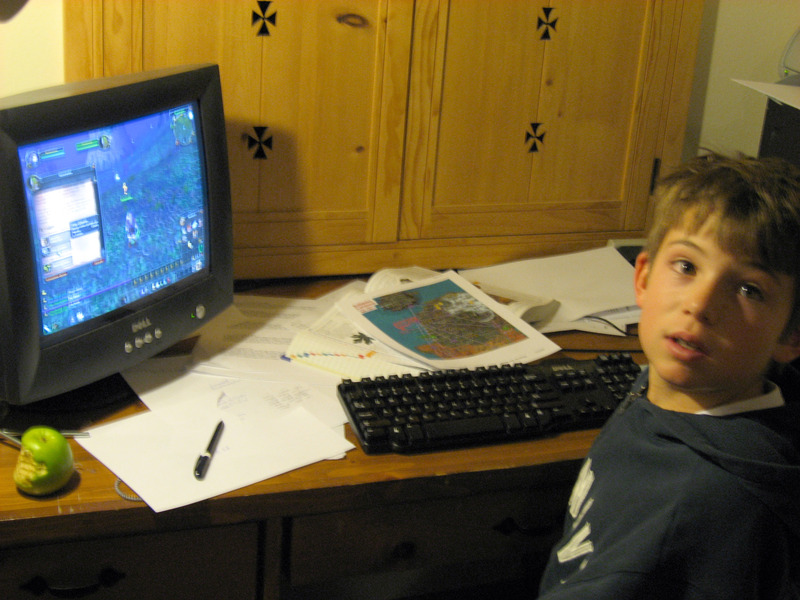 Eli started playing World of Warcraft (I helped introduce him to it). Here is Eli below playing a level 8 hunter night elf. Click here for more information on World of Warcraft. 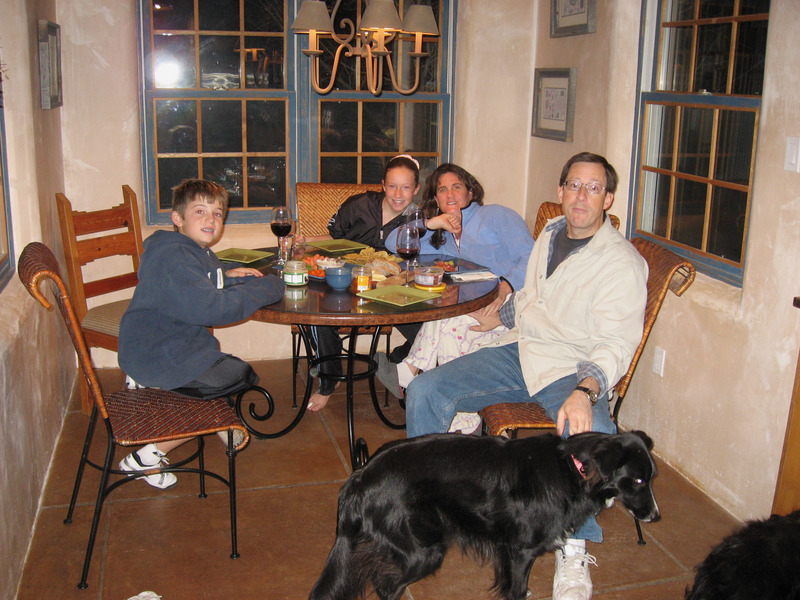 A picture of my brother's family at dinner, from left to right Eli, Ari, Ramey, Randy. The dog in front is named Lucky (and very old 14 year old "Poe" is seen as the block spot in the lower right corner). 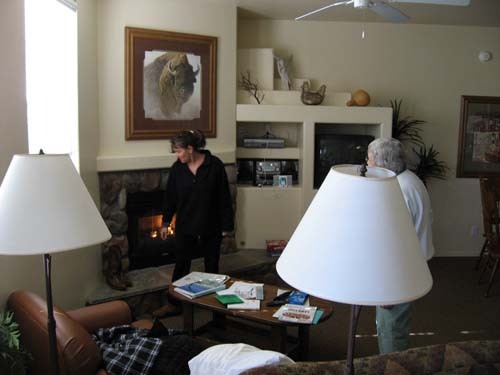 Below is Randy sitting in his living room, (in the far back you can see the kitchen of their house). 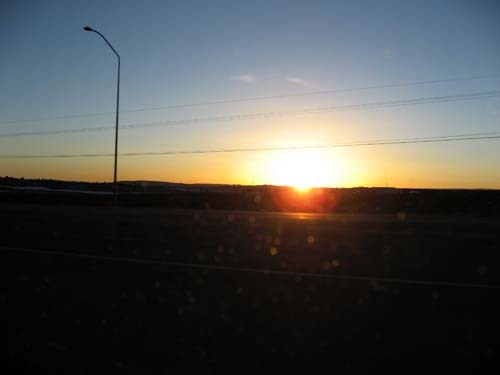 This is the view out the back porch of Randy and Ramey's home in Albuquerque, New Mexico. Their swimming pool is on the right (closed for the winter, you can still see snow sitting on the deck and on the pool cover).